It is hard (or maybe, not so hard) to imagine what it must have been like for these first Christians. In addition, of course, these were the Apostle Paul’s very first (and I think, most treasured) group of converts. What the Agitators had led them to believe was true, Paul exposed as a lie, i.e. a religious system based on externals had been shown up for the hollow and empty husk that it was. Yet, the blunt reality was that those who held on to this truth were in a dwindling minority. Even today, those who believe in the mystery gospel [Col. 1:27] remain an endangered species. When our children were growing up, they had a book they loved above all others. It was called “The Faraway Tree”. 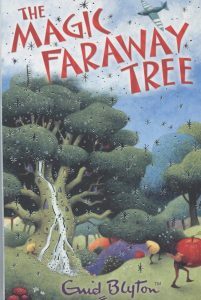 It was a beautiful book with a story about a group of children who, having climbed a magic tree, entered into a different world. How that reminds me now of the tree of the knowledge of good & evil. One of the lands they discovered there was The Topsy-Turvy Land, the land where everything was upside down! Can you think of some more examples? Here is the great secret. In the religious world, salvation is about changing the container, but in grace, it is only ever about changing the contents of that container – taking out the old and dead and replacing it with the new and alive, the new me and the new you. One thing that I must forewarn you about is that those under the religious system hate those who are not under its curse. More than anything, what they hate the most is that we are free to love and free to love them, regardless of whether they love us.